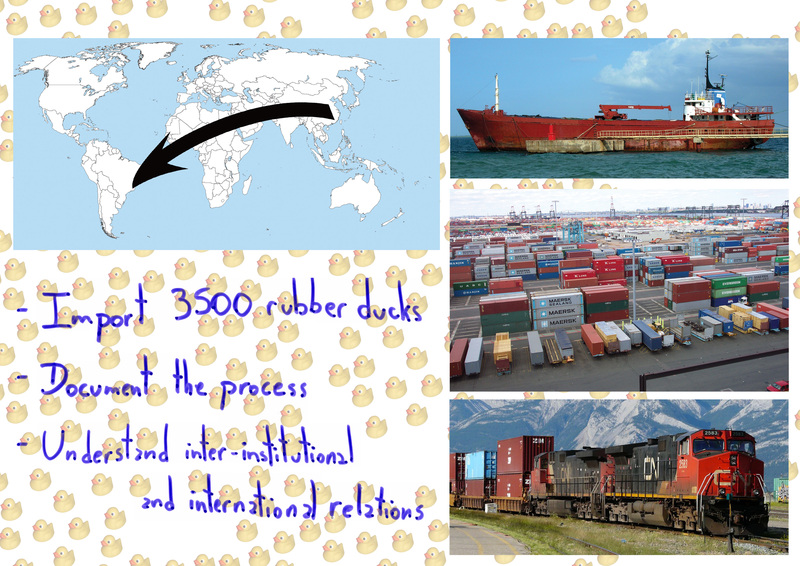 Migrations is the process of purchasing an industrial number of rubber ducks from a factory in China and import to wherever happens the exhibition. This process is documented in every possible way, through video, photography, official documents, audio clips, so it can communicate the enormous efforts to make available resources, from daily goods to industrial supplies. This practice is only made possible by the current stage of globalization in which we live in, originated from specific perceptions in space and time. This work is based on manipulating social organizations and systems, ones legitimate to non-artistic instances, closer to capitalism, in order to make explicit the very processes that support the current globalized society. This way, I problematize the notions of space and time built in the distribution of services and goods and the notion of consumption, as well as to emphasize some contemporary processes of producing art. Tine tuned to what Walead Beshty says about his works , it is not about a modern idea of drawing on the globe as a canvas or simply escaping the scale of human perception without instruments. This is already made daily as a standard procedure outside art and a resolved discussion inside art. A particular way of looking art is that it is a legacy. According to Marcel Duchamp ‘Art is a game between all men of all times’ . We should, then, use strategies and tools of our time to produce works, executing moves impossible in the past, proposing ways of thoughts to be used in the future. In his book Post-production, Nicolas Bourriaud stresses the use of market as an environment for relationships. He says “Commerce is is, first of all, a form of human relation, or better, an excuse to create a relation.Any transaction can be defined as an encounter of histories, affinities, wills, pressures, blackmails, conducts, tensions. This market is dominated by companies, institutions that operate exchanges mediated by money. And Migrations happens when the artist articulate this relationships to happen and to be objects of exhibition.